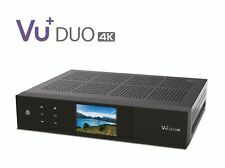 VU Uno 4K SE Linux UHD set top box. At the heart of the VU Uno 4K SE is the 2x 1,700 MHz ARM DualCore processor.Experience UltraHighDefinition (UHD) TV with the VU Uno 4K SE set-top box. What is a DVB-S2 FBC Twin Tuner?. 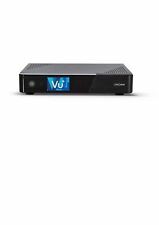 VU Solo 4k Triple Tuner With 750Gb Internal HDD 2 X Sat tuners / 1 X Cable tuner. Plug & Play drive caddy for 2.5 "SATA - hard drives (max 10,5mm HDD height.). 750 Gb HDD fitted. 1x tuner Slot with DVB-C / T2 single tuner. VU ZERO 4K 1X DVB-S2X TUNER LINUX UHD 2160P FREE VU Darkgold LNB 0.1db. Condition is New. Dispatched with Royal Mail 1st Class. 1 x tuner DVB S2X. The heart of the VU is zero 4 K the 2 x 1,500 MHz powerful ARM multicore processor. Experience UltraHighDefinition (UHD) TV with the VU zero 4 K set-top-box. 1 x VU zero 4 K DVB S2X UHD receiver. ULTRA HD 4K 2160p. - VU ZERO 4K tuner. VU ZERO 4K DVB-T2/C. - Linux (available alternative software is: Blackhole, PLi, VTI, VIX,Enigma2). - Open-Source Linux System (compliant with E2). It is a TV-SAT HD receiver equipped with 1 DVB-T2/C TUNER. VU Zero 4K Specs 4k HEVC/VP9 HDR Decode. Amature Radio. TV Bracket. TV accessories. No Transcoding. Power Leads UK. hot products. 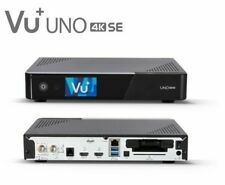 VU Uno 4K SE Linux UHD set top box. At the heart of the VU Uno 4K SE is the 2x 1,700 MHz ARM DualCore processor. Experience UltraHighDefinition (UHD) TV with the VU Uno 4K SE set-top box. What is a DVB-S2 FBC Twin Tuner?. Newest Dual DVB-T/T2 MTSIF Terrestrial tuner module ! 1x tuner slot for eg DVB-S2 / DVB-C Full Band Capture (FBC) tuner / Dual DVB-T/T2 MTSIF Terrestrial. At the heart of the VU Uno 4K SE is the 2x 1,700 MHz ARM DualCore processor.Experience UltraHighDefinition (UHD) TV with the VU Uno 4K SE set-top box. The heart of the VU Dup 4K is the 2,100 MHz ARM QuadCore processor with 64-bit technology. Experience UltraHighDefinition (UHD) TV with the VU Duo 4K set-top box. What is a DVB-S2 FBC Twin Tuner?. The heart of the VU Ultimo 4K is the 4x 1.500 MHz ARM QuadCore processor. Experience Ultra High Definition (UHD) TV with the VU Ultimo 4K Set-Top-Box. VU Ultimo 4K Linux UHD Set-top box. What is a DVB-S2 FBC Twin Tuner?. Der VU Zero 4K ist ein preisgünstiger Einstiegsreceiver in die ultrahochauflösende (4K) TV-Welt. Der VU Zero 4K bietet erstmalig einen S2X Tuner und ist somit für die Zukunft gewappnet. Das Herzstück der VU Zero 4K ist der 2x 1.500 MHz starke ARM DualCore-Prozessor. The heart of the VU Ultimo 4K is the 4x 1.500 MHz ARM QuadCore processor. Experience Ultra High Definition (UHD) TV with the VU Ultimo 4K Set-Top-Box. What is a DVB-S2 FBC Twin Tuner?. A DVB-S2 FBC Twin Tuner has 8 demodulators. 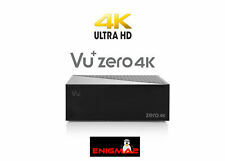 VU Uno 4K SE Linux UHD set top box we instal Enigma2 includes oscam. 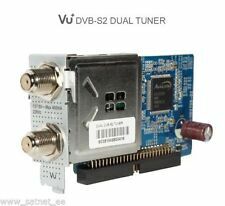 What is a DVB-S2 FBC Twin Tuner?. A DVB-S2 FBC Twin Tuner has 8 demodulators. What is a DVB-C FBC tuner?. A DVB-C FBC tuner has 8 demodulators. VU ULTIMO 4K 1x Dual FBC - S/S2/S2X Linux E2. 2 x Advanced Pluggable Tuner system for FBC DVB-S2 (16 Demodulators). 1 x Advanced Pluggable Tuner system for FBC DVB-C (8 Demodulators). Tuner : 2 x Plug&Play FBC DVB-S2 or 1 x DVB-C. VU Ultimo 4K 1x DVB-S2 FBC Twin / 1x DVB-C FBC Tuner PVR ready Linux Receiver UHD 2160p. What is a DVB-S2 FBC Twin Tuner?. A DVB-S2 FBC Twin Tuner has 8 demodulators. What is a DVB-C FBC tuner?. A DVB-C FBC tuner has 8 demodulators. With the VU Uno 4K SE, VU has expanded its product range with another UHD receiver. At the heart of the VU Uno 4K SE is the 2x 1,700 MHz ARM DualCore processor. Experience UltraHighDefinition (UHD) TV with the VU Uno 4K SE set-top box. Best in the world firmware support. Enigma2 firmwares from all developers teams. 1 x Pluggable Dual FBC DVB-S2/S2X or FBC DVB-C or Dual DVB-T2. Strongly Enchanced receiver compare with regular Vu Uno 4k. Support 8 Tuners (Demodulators). Two DVB-S2X tuners built into one single tuner module. Full Band Capture Tuner. Support Dual LNB Input. With the VU UN 4 K SE extended VU range by a further UHD receiver. The VU UN 4 K SE offers Plug -and-play full band capture (FBC) tuner and so lightning-fast program changes. The integrated tuner slot can accommodate a DVB-S2 FBC or a DVB-C FBC tuner. The large resources to the Gigabit LAN interface and USB 3.0 ports open up completely new possibilities for the future. A 500 GB hard drive included is also in this variant. 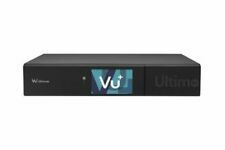 VU Ultimo 4 K PVR ready Linux receiver UHD 2160 p 2 x FBC DVB-S2 dual twin tuner including 4000 GB hard disk. Ultimo 4 K extended range with the VU VU a further UHD receiver. VU Ultimo 4 K Linux UHD set-top-box. The heart of the VU duo 4 K is the 2,100 MHz powerful ARM quad core processor with 64Bit-Technologie. Experience UltraHighDefinition (UHD) TV with the VU duo 4 K set-top-box. What is a FBC twin tuner DVB-S2?. VU DVB-S2 DUAL TUNER UN / ULTIMO / DUO M² / SOLO SE V2 / SOLO 4 K. Manufacturer: VU . 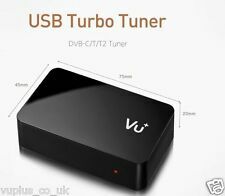 VU zero 4 K 1 x DVB S2X multi-stream tuner Linux receiver UHD 2160 p. Vu Solo Se V2. Vu Solo SE. Supported VU set-top boxes.